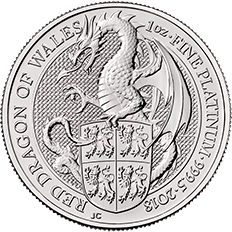 Following on from the success of The Queen’s Beasts range of gold and silver bullion coins, the range was further expanded in 2017 to include platinum. 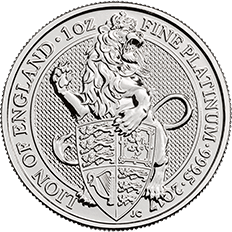 The introduction of platinum in The Queen’s Beasts range of coins represents a new and exciting opportunity for investors as The Queen’s Beast Lion 1 oz Platinum Bullion coin was the first ever United Kingdom platinum bullion coin available from The Royal Mint. 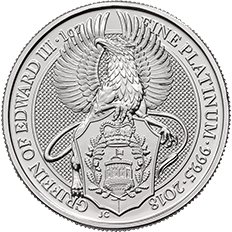 All United Kingdom platinum bullion coins available from The Royal Mint are struck in 999.5 fine platinum and are exempt from capital gains tax for UK residents. 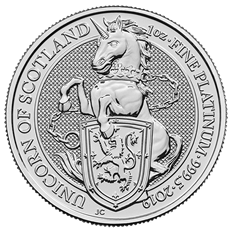 The Queen’s Beasts range of platinum bullion coins is adorned with the same designs as can be found on the silver and gold coins which was created by Royal Mint coin designer, Jody Clark. 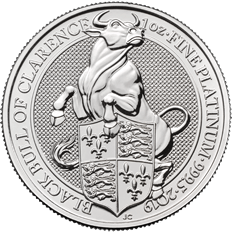 All of our Queen’s Beasts Platinum bullion coins are available as 1 oz coins and are available with free UK delivery.